CDT doesn’t do concerts, eisteddfods or competitions. Twice a year we hold a House Party in the studio where all classes can come together, meet, celebrate what they do and show off to each other. It’s an open event so all are welcome and we put on a great show. Expect to see up to 20 short presentations and performances. June and December each year. 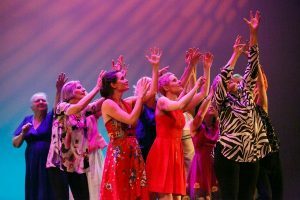 It was 40 years ago today… In 1978 Canberra Dance Theatre was born, and in 2018 we celebrated our 40th birthday with a very special project for everyone who wanted to be involved, with three performances at The Street Theatre 12, 13, 14 October 2018. This project was coordinated by Jacqui Simmonds, starting with Emma Saunders’ HAPPINESS IS... creative development.